Highback swivel armchair Image shows polished aluminium base and Multi-adjustable arms Over 1.3 million of the Giroflex 64 have been sold worldwide. This kind of success is no coincidence - this classic chair represents the unification of design and ergonomics at its highest level. G64 has set new standards for this market sector. 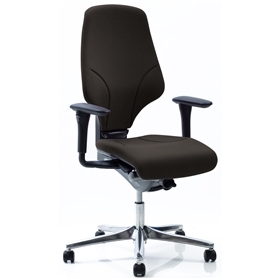 Its precision engineering delivers a chair of proven longevity. 98% of its parts recyclable. Designer - Walser Design.